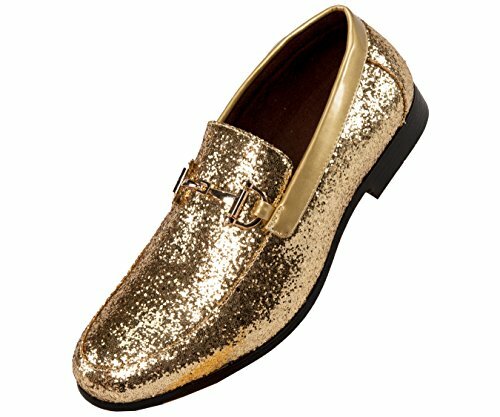 A modern take on a classic style, these metallic dress shoes are sure to be noticed. Soft manmade microfiber fabric is given a metallic splatter-paint effect, taking these timeless smoking slippers from basic to bold. Pair with a black-and-pop color ensemble to create a complete, statement-making look, or let the metallic accents truly shine against a simple black outfit-either way, this style will stand out. The metallic nature of these shoes makes them ideal for special events, such as New Year's Eve, holiday parties, date night, clubbing, or any other festive occasion where making an impact with your outfit is key. A low block heel makes these shoes as comfortable as they are stylish-they're perfect to wear again and again.These slip-on shoes run true to size, so select your normal size when ordering. Their comfortable soft construction makes them easy to break in and wear right out of the box. This sought-after style is also available in metallic red, silver, fuchsia, turquoise, gold and royal blue, so you can easily coordinate with all your favorite looks. Add this one-of-a-kind silhouette to your closet, and let the compliments roll in. If you have any questions about this product by Amali, contact us by completing and submitting the form below. If you are looking for a specif part number, please include it with your message.